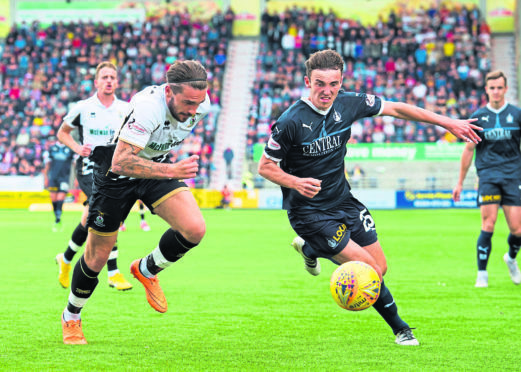 George Oakley netted Inverness' winner against Falkirk. Caley Thistle manager John Robertson insists he is keen to accommodate two strikers in his forward line this season. Inverness have four striking options, with Nathan Austin and goalscorer George Oakley given the nod for Saturday’s opening day 1-0 Championship win over Falkirk, while Jordan White has also joined from Barrow and teenager Daniel MacKay continues to impress. Although the 4-3-3 system Robertson predominantly played last season only incorporated one out-and-out attacker, the Caley Jags boss intends on playing two up front this term and has urged his strikers to show him it can work. Robertson said: “I want to play two up front whenever I can – I believe that’s the way to get results. “We had to batten the hatches down last year and learn how to defend, we played 4-3-3 and it worked for us with 10 clean sheets in 12 games, but we weren’t the threat up front we wanted to be. “George and Nathan started against Falkirk, but Jordan White and Daniel MacKay can also come on and provide that threat. “I pulled all four of them aside at lunchtime on Saturday and had a real good chat with them. Englishman Oakley finished Inverness’ leading goalscorer in his first season since joining from AFC Wimbledon last year, ending the campaign with 12 goals, however he has had to be patient so far this term having made just two starts in the Betfred Cup group campaign. After netting his second goal of the campaign against the Bairns on Saturday, Robertson has praised the attitude shown by 22-year-old Oakley, adding: “George was a bit upset he didn’t get a run against Hearts last week, and he went down to Fort William, scored three goals and showed he was determined to get back into the team.